For more information on the S3D Centre’s research activities in HFR and other areas, and to see our current supporting press material please visit HFR Research home. We advise the reading of the first HFR Blog #1 Here before reading on. HFR = High Frame Rates. Traditionally, cinema productions are filmed at 24 frames per second, or for broadcast at 29.97 (30) frames per second. There are numerous advantages to filming in HFR, especially in 3D. VFR = Variable Frame Rates. This is the use of multiple frame rates within the same container/sequence. Does the utilization of HFR as a ‘tool’ in this regard change the immersive experience for the viewer? We suspect that the question of whether or not to utilize HFR in a stereoscopic 3D film within a narrative context depends largely on the creative intent of the film itself. To re-iterate: We are researching not only the standalone benefits of higher frame rates in S3D, but also the effect of VARIABLE HFR on aesthetic and immersion in the context of a single narrative. The concept and storyline of “L’âme Soeur (Soul Mate) 3D” was created with the intent of experimenting with variable frame rates from the beginning (both standard 24fps and HFR). Variable frame rates will be referred to this point forward as VFR. We were initially inspired by the idea of HFR after hearing Wim Wenders keynote at the 2011 Toronto International S3D Conference. The accomplished filmmaker expressed his thoughts about his landmark S3D documentary “Pina” being considered a candidate for HFR capture at one point in pre-production. As Wenders explains about his decision to film in 3D: “The two-dimensional cinema screen is simply not capable of capturing Pina Bausch’s work, either emotionally or aesthetically. When I watched her dance for the first time twenty-five years ago, I was captivated and deeply moved. I was able to understand human movement, gestures and feelings in a whole new way. 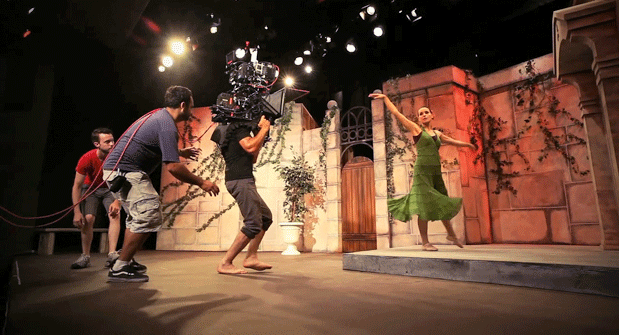 And this magic is what I would like to translate to the screen […] 3D gives us the possibility of taking the audience directly onto the stage, into the middle of the event.” With “Pina” already being such a shining example of the art and technical achievement of S3D filmmaking, the thought of it also being filmed in HFR was striking. Would such a graceful, raw example of dance and human emotion that “Pina” is, become elevated with the use of HFR? Or would the use of HFR, noted for its ‘ultra-real’ definition, work against the beauty and emotion of the film? It is hard to imagine now what audience reaction may have been, but we did suspect that the use of HFR might have worked both for and against the film if its use was indeed employed. A screenshot from “L’âme Soeur (Soul Mate) 3D”. Does HFR/VFR affect the aesthetic of graceful dance? Our interest in the topic grew as it was announced The Hobbit was filming in 48fps, and a year later audience reactions from CinemaCon 2012 was widely mixed. There had been reports of the HFR implementation working both for and against clips demonstrated, but as I have noted previously, this could also be due to the fact that the clips were not shown in the context of a narrative and furthermore were incomplete in VFX, grading and audio. 2. What does stationary movement/fast action look like? 3. How does HFR effect reflection? 5. How does HFR affect REALISM? We built the composition, framing, staging and action all within the structure of these five priorities. And the truth is while on location, we ended up altering our shots on several occasions to respond to the observations/desires we had at that time, while in the moment. For example, the decision to accommodate a request from a crew member to attempt a hand held shot resulted in one of the more interesting compositions of the shoot. On another occasion more dolly movement was used in a scene to address concerns around strobing/blur in moving S3D shots, and test these concerns on the spot. A Kernercam S3D rig with two Red Epics mounted on a shoulder. To see the video in action, visit our Vimeo site. So what is the ”L’âme Soeur (Soul Mate) 3D” story exactly? Deeply inspired by the success of “Pina”, we decided that the narrative and action sequences of the story would revolve around dance. We believed that this was an artful departure from other HFR experimentation that filmed martial arts and boxing content. Synopsis: A return to the theatre ensures that an elderly husband and wife couple is able to escape once more into their youth- and their youth means nothing without the devotion and love they have formed over their long lives. Elderly dancer Helen Derobe has always been a person of few words, preferring to show rather than tell. Her husband is everything to her and she finds herself becoming more dependent on him. Lately she is unable to use words to describe what her husband means to her, so she reminds him once more- through dance, which had initially brought them close together. As I previously mentioned, we had imagined early on the use of an elaborate shot list that tests many of the theorized HFR and VFR capabilities. Once we realized this would be tremendously difficult to do (both time and space issues) it was thinned out. 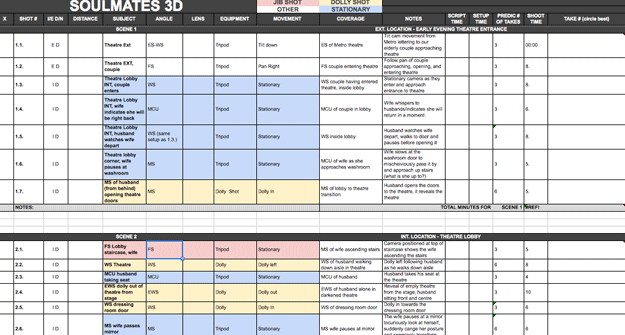 You may notice it looks like a very traditional shot list, not one that explains any S3D or HFR/VFR components. We found the Shot list would be confusing to most of the camera crew, and instead we decided for the directors/producers to use the Shot list as a tool to guide the shots since the HFR/VFR components were already planned within it. Rather we would allow the DOP and Stereographers to have complete creative control of the lighting and Stereo, while using the shot list as a guide for framing. A storyboard was discussed, and even drafted but it was decided that the boards would not help much due to the space that we were filming in being very customizable. We were working with a stage that allowed for the action and even camera equipment to be adjusted as we felt fit. We theorized that we would change our intial staging/framing ideas once we actually begin working inside the space, and this proved to be very much true. We also spent a considerable amount of time on props and set decoration. In our attempt to test out what HFR looked like, we wanted to play with lots of mirrors and surfaces provided reflection/refraction. Not exactly what most S3D productions would consider pleasant, but we did want to see if HFR affected the common issues around reflection (which can be very distracting in that they do not mimic normal perception in real life. They often float within the Stereo 3D depth). It was important with all these reflective surfaces that we avoid light flares, and this was considered in pre-production before dressing the set. This ends part 1 of this topic. Stay tuned for Part 2 on Effective Pre-Production and Production of Variable HFR projects on November 13th.